Blues, greens, whites (opaque), ceramic, very little brown. Most pieces frosted. Stopped at the beach after four days of very high winds. Nice parking lot. The beach was freshly combed. Great beach, very clean. Safe area. I was walking along the shore looking for rocks (my thing) and found sea glass. Sea Glass is new for me. I found all this plus some ceramic pieces in about 30 minutes. I’m sure I would have found more easily but I ran out of time. Now that I know what I’m looking for, I’m sure I will do better in the future. you had more luck than I did! I went to Edgewater today, and it was crowded due to the Eclipse festivities going on. 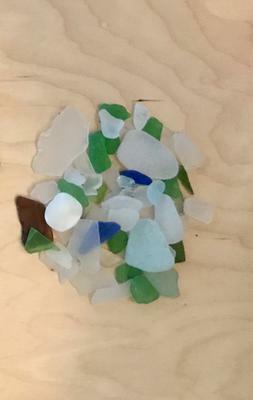 I found some teeny, tiny pieces of beach glass, mostly clear, a green, a brown, one blue and one pale blue. Will keep searching to find the best beach for finding sea glass. Lucky! I was there the day before you posted this (August 11th) and I only found one piece of Kelly green! However, I was only looking in one small sandy area of the beach for about a half hour. I was at the beach with my grandparents, which meant I couldn't go too far. Great finds, though! I would love to return to this beach one day and explore it a bit more, as I live in the area.